The Peoples' Democratic Party (HDP) announced Monday it will not nominate mayoral candidates for seven major municipalities, including Istanbul, Izmir and Ankara, in Turkey's March 31 local elections. 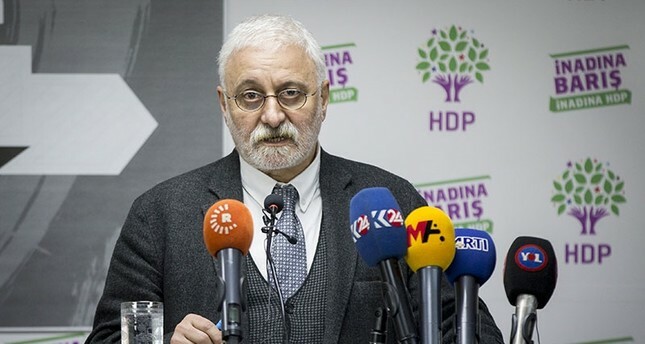 HDP spokesman Saruhan Oluç also said the party would not nominate candidates for Gaziantep, Şanlıurfa, Adana and Mersin. "We are not doing this on behalf of this or that party. We are doing this for the struggle for democracy," Oluç said. In recent years, HDP mayors and local officials have been found to misuse funds in support of the PKK terrorist group and provide jobs to PKK sympathizers. Investigations by the Justice Department have led to dozens of mayors and local officials' removal from their posts and, in some cases, criminal charges being brought against them by the court. For instance, illegal materials used for bomb making were found in a truck belonging to HDP-run Van municipality, while mortar shells and a gun were found during a raid to the building of Şırnak municipality governed by the pro-PKK Peace and Democracy Party (BDP), a regional affiliate of the HDP. The PKK is listed as a terrorist organization by Turkey, the United States and EU, and has been responsible for the deaths of more than 40,000 security forces and civilians over 30 years. Turkish local polls are held every five years to elect mayors of 1,397 municipalities, including 30 metropolitan, 51 provincial, 519 metropolitan district, 400 district, and 397 town municipalities. Along with mayors, voters will also elect municipal council members in cities and village heads (muhtars) and members of elder's councils. The last local elections were held on March 30, 2014, which saw the ruling Justice and Development Party (AK Party) clinch more than 45.5 percent of the vote. Precise lists of candidates will be announced on March 3. On March 21, election advertising bans will commence. The period for election advertising will end one day before the election at 6 p.m.